The club incorporates six sporting sections - Cricket, Tennis, Hockey, Lacrosse, Bowls and Squash. We always welcome new members. Please visit the membership page for more details. 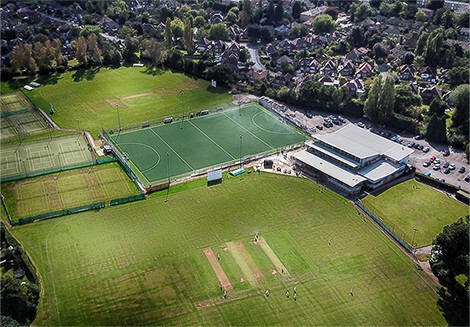 The club offers excellent facilities including 2 cricket pitches, 4 all-weather cricket nets, 3 squash courts, 3 grass and 10 all-weather tennis courts and a full-sized all-weather water-based astroturf hockey pitch. The clubhouse is fully equipped with changing rooms, showers and other facilities. A bar on-site is open to members all year round and the site is shared with a health-club which offers a gym, dance studio, swimming pool, sauna and steamroom. Some sections have their own website, which can be accessed by clicking the logos along the top of the screen. Members can login and adminster their membership by choosing 'Member Login' on the menu above or by clicking here .